Going back to the old saying, you are what you eat... I am really quite thankful to be a vegetarian! My friend Nate's host family taught him how to slaughter a chicken on his own. After learning how to do this with his family, he invited a few of us over to see what it's like. People laughed when I said I wanted to attend since I'm a vegetarian, but I'm glad that I did. It was a good cultural activity to observe.... and definitely reconfirmed that I don't think I'll ever be able to eat meat again. Jvani with the chicken head :-( She's vegetarian too! I'm living quite simply & loving my diet as a vegetarian here. It's amazing how out of touch we can be with our food! We don't even give food a second thought as we pick it up in the grocery store. I think it's a good idea to question where your food comes from! Happy eating everyone! As my host mother likes to say, “auntie tah-tee, time is running. Where is it going?” Tate is not easily pronounced here, so tah-tee it is. I couldn’t possibly agree more with my host mom. Days are slipping away from me so quickly! 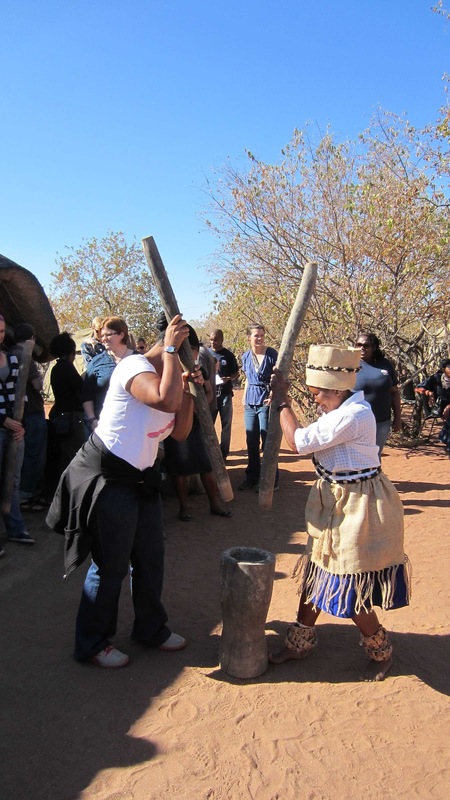 Last weekend, we had the opportunity to visit the Bahurutshe cultural lodge. 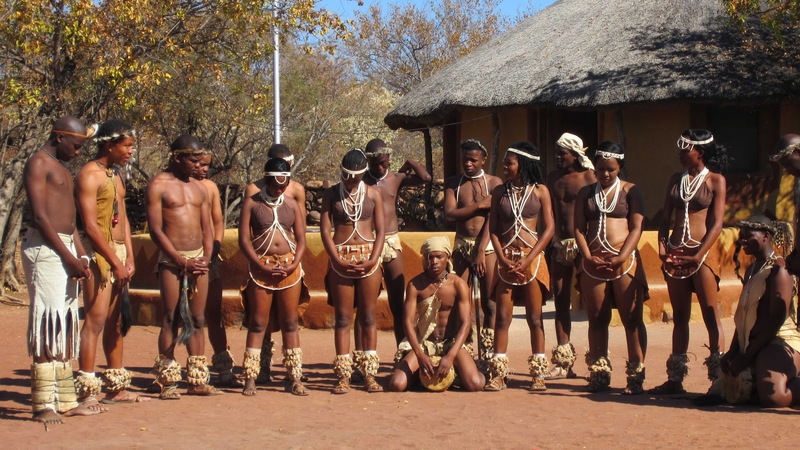 Upon arrival, the Kgosi greeted us with a traditional dance which was followed by dances put together by his children and grandchildren. The people of Mmankgodi village also shared various cultural practices; grinding sorghum and preparing traditional tswana foods, singing songs, and explaining customs behind marriage and harvesting crops. 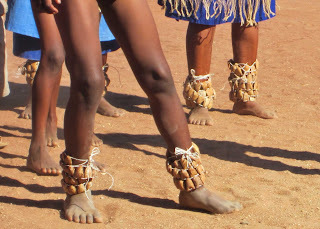 Although it was a bit touristy, I definitely learned a lot about the culture in Botswana and since then, I actually have a greater understanding for some of the everyday things I see in Kanye. I was chosen to try to learn their dances.... ha! The only downside of meeting with Constance was learning about my housing situation… which is to be determined. :o) Counterparts are in charge of finding housing for Peace Corps volunteers. It’s not quite like the United States here, you can’t exactly move at the drop of a hat. Moving takes planning, planning, and more planning. There aren’t extra houses, apartments or condos to move into. As I’ve mentioned before, I am not replacing a volunteer in the clinic, so they are struggling to find housing to fulfill Peace Corps’ requirements. At the moment, I’ve been told that they have found the home they want me to move into, but I still don’t have any furniture or electricity. Details. :o) Electricity is not a requirement from the Peace Corps, but almost 90 % of volunteers currently have electricity. The catch is that they are NOW (this is very recent) required to provide a refrigerator because the climate is so hot during the summer, food will perish too quickly without a fridge. My counterpart really wants me to have a fridge run on electricity (rather than gas) because it is cheaper and more convenient. Long story short? I have no clue what house I am moving into when I arrive in Kang. If all else fails, I will temporarily be staying in the guest room of the other Peace Corps Volunteer in Kang. We shall see! You’ve gotta love the suspense… I think I may be getting used to it :o) Cross your fingers I will have a home! This past week, I think most of us went through our “post-honeymoon phase.” Everything is real, exciting, inspiring and wonderful for the first six-eight weeks, and then.. well, it’s not so great anymore. The truth is that most of us hit a wall this past week and all of the commotion has finally caught up with us. We’re tired and overwhelmed. My mom called me this week when I was at my all-time low and talking with her was really helpful. What I’m going through right now isn’t horrible at all, and what’s even more important to realize is that it isn’t any different from a “down day” that YOU would experience in the states. Everyone has their moment and mine was last week. The group went in waves – some of us were still honeymooners, while others were very “blah”, and then suddenly, we all switch. Life goes on :o) and we all love each other through it…. Setswana lessons have become a part of my life again because my sekgalagadi teacher left the Peace Corps. She found a different job that suited her much better because it was full time, and so we were happy to see her move onto to greener pastures. That left the six of us learning sekgalagadi without a teacher and a week behind in Setswana. Sheesh. One of the reasons for my slump last week… it has been really difficult bouncing around and feeling like you’ll never know enough. We all laugh and say we are losing English as well. We try to learn Setswana/Sekgalagadi & without gaining much, we lose so much of our English grammar. Please do me a favor and don’t tell me how much worse it gets over time :o) Over the weekend, I tried to teach myself all of the past/future tenses of verbs and object pronouns. Hopefully I retain the information! My clinic in Kang has a patient population speaking Setswana, so my studies over the next few weeks won’t be going to waste. Constance told me there are four languages spoken in the clinic, so it looks like I will have a lot to learn about linguistics, no matter what way you look at it. 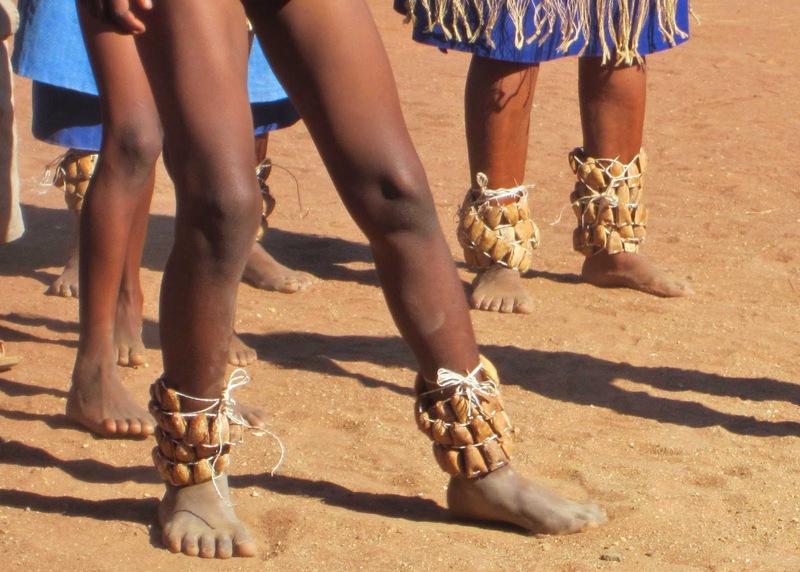 Sekgalagadi and Setswana are similar enough that you can understand someone speaking Sekgalagadi and my host father has been trying to teach me in the evenings so I can at least move to Kang with the basics. Two and a half weeks to go! The end of training is in sight and we are all feeling anxious to swear in as official Peace Corps Volunteers. Swearing In day is June 12 and we all move to our new sites on June 13. Hurray! Oh, and p.s., I clued a few people in about this – but in case you want to say the name of my village correctly, think of King Kong. Kang = Kong :o) I actually had a local here laugh at me when I told them where I’m moving, and he said, “Kang? You’re truly moving to the MIDDLE of the Kgalagadi desert.” Yes sir, I am. And I’ve been waiting for so many years to get here! After years of patience with the Peace Corps application process, I have FINALLY found out where I will be serving for the next two years. The whole week seemed to drag on forever due to our anxiety and anticipation. On Friday afternoon, Peace Corps staff revealed all of the site placements for the Botswana 12 trainee group. When we entered the room, there was a large map of Botswana with small tabs all over indicating where a volunteer would be placed. Each volunteer received a name card with a number on the back. I was number 43… and so you wait in anticipation. They randomly called out volunteers in different districts and called you up by your number, allowing you to announce to the group where you had been placed. At that point, you put a picture of yourself where your new home will be located. I am pleased to announce that I will be serving in KANG, BOTSWANA. As far as housing goes, I still have not received any information about where I will be living. I am meeting with my counterpart next week to discuss my role within the clinic and community, so hopefully I will know more about my project and housing at that point. I do not know much more than what I have described because I will be blazing my own trail with this CCB position in Kang. My fears about having to replace an incredible/terrible volunteer have now been calmed & I am looking forward to creating a name for myself at the clinic. Other volunteers are clustered around the country and they are very close to one another. The six of us in my new language group are the most isolated out of the trainee group; it really looks funny on the map. My closest friend here will be in the same district as me, but she is still hours away by bus. Not so bad, but it will be a challenge to be as isolated as we are in comparison to other volunteers. Regardless, I am very excited and I haven’t heard many bad things about Kang. My host father used to spend time there and he said that people from Kang are very proud of their community and they are very understanding and involved. Could I have asked for more? Oh, also, Kang is along the main road which means transportation in/out of the village will be relatively easy. PC staff made sure that I will have access to food I can eat in Kang and if I really need to get to a bigger shopper village, I can go every other week to buy local produce. Another plus is that I’ve heard gardening is ideal in my community! It’s wonderful to FINALLY know where I will be going after all of this time. The trainees were talking about how long we’ve been waiting to hear our site placement and how many years we have been waiting for this day to come! Some people were really disappointed in their site placement, but I’ve learned that by having no expectations you can limit your disappointment. I am really pleased about my site and all that I’ve heard about the community, I will learn more about it next week. Internet is now available for us to use at school, but I say that and it still makes me laugh. It’s not reliable at all because the network and/or the electricity goes out quite often. Six weeks done, less than four to go until I move to Kang. Time is flying by! Missing you all dearly…I will try to upload pictures soon if possible!! My life has been quite eventful in the past few weeks! Peace Corps is attempting to prepare all of the PC Trainees for life as a volunteer. Last weekend, we had an entire morning devoted to gardening. PC staff taught us various gardening techniques to help us live in a more sustainable manner. I am really interested in gardening on my own throughout my two years and I quickly learned what a chore it can be! Gardening is a lot of work no matter where you are, but I am certain it is going to be quite a task here in Botswana. The Peace Corps is also preparing us for life as a volunteer by sending us out to shadow another volunteer who is currently serving in Botswana. As I said before, I went to Shoshong to visit Amelia for my shadowing week. Shoshong was about four hours away by bus and I had great traveling experiences. I was feeling very anxious about traveling around the country, attempting to speak an unfamiliar language, but to my surprise, everyone was incredibly kind and receptive to my travel plans. Batswana go out of their way to help you find the correct bus and I never felt threatened at all! Throughout my week of shadowing, I traveled by way of bus, khombi (small shuttle van), taxi, and hitch hiking. Buses can be very luxurious, similar to a grey hound bus in the US, or they can be completely packed with people. Buses are a reliable way to travel in this country and your comfort level during the ride will depend on where you are going and how much money you are willing to spend. Khombi's are often very hot, uncomfortable and crowded. Passenger limits don't seem to phase anyone here. It's not unlikely to have a complete stranger sitting in your lap in a khombi... you're forced to become friends quickly! Taxis are very common within the bigger cities/villages and unlike the United States, taxis rides are shared with strangers. When you flag down a taxi, expect to be entering a car full of people or expect to be picking up strangers along the way! Hitch hiking in Botswana is NOT like the United States at all. In the United States, no one would ever hitch as a safe, reliable method of transportation. Here, the rules are a bit different. Often, between smaller villages, there are not khombis or buses, so people are forced to hitch with people who have cars. Unlike hitching in the states, you are expected to pay for your hitch and the price you pay is equal to the amount of money you would pay on a bus to go the same distance. Hitching is very similar to grabbing a shared taxi ride, but you are riding with a local who is trying to make some money for gas. Although some of those transportation options seem crazy at first, I slowly became comfortable with navigating my way through the country. Amelia was an incredible host during my week in Shoshong and I learned a lot from her service. She is also a Community Capacity Builder based in a local clinic but her involvement with the community didn't stop there. Amelia works with the youth in the schools to teach a life skills class, helps community members write proposals to start a small business, organizes big awareness events, etc. She taught me a lot about the idea that "YOUR SERVICE IS WHAT YOU MAKE OF IT." 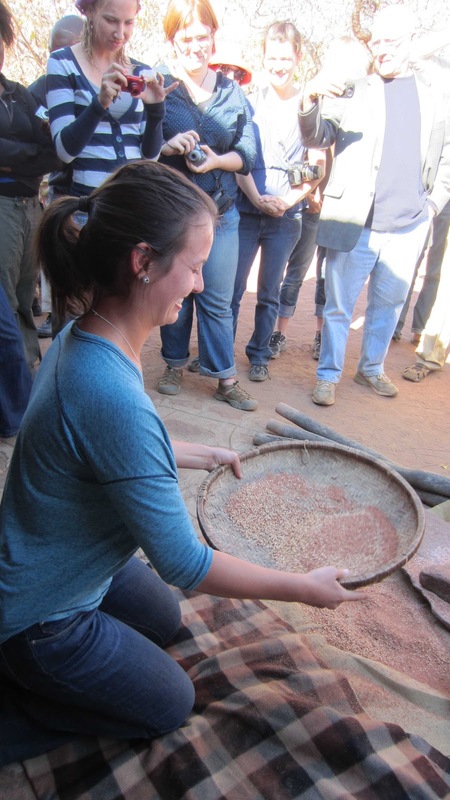 It sounds incredibly cheesy, but as a Peace Corps volunteer, you have to choose how much work you want to put into things. Some people are content with doing the bare minimum, but of course you all know me... I can't wait to jump into as many projects as possible! We visited Old Shoshong - which is a historical site where missionaries lived in the past. We helped a woman in the community find funding to start her own small business (quiliting). We did home visits throughout the week - people ask Amelia to come and "check" them. I talked to two women who recently gave birth and they explained superstitions & traditions around pregnancy in their culture. 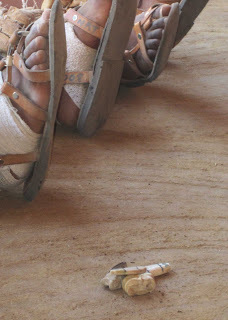 We visited another volunteer in Machaneng to see another perspective of life as a volunteer. Finally, we spent the weekend camping at Tuli Banks. I will explain more in a moment! Stephanie is the volunteer who we stayed with in Machaneng. She is about to leave to go back to the United States after her two years of service. I really enjoyed talking with Stephanie about her experiences, she seems to have learned a lot. 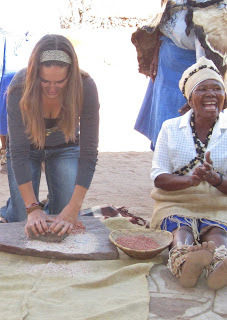 Steph met an amazing family in her village who owns a large farm near the border of South Africa. Their family offered to take all of her volunteer friends out to the Tuli Banks Farm to go camping for the weekend. Of course, we all loved the idea! The family was incredibly generous - they fed us throughout the weekend, allowed us to stay at their campsites, took us all around the farms & there was even a hot shower!! We spent all day on Saturday on a game drive to see all the animals. We saw warthogs, wildebeasts, spring boc, vultures and other native birds, a few other animals I can't remember the names of, and best of all - GIRAFFES! I was so excited - we were very close to the giraffes and I have never seen something quite as magestic. We all love to see them in the zoo, but seeing them in the wild was something I will remember for the rest of my life. The family was laughing at me because I was so excited. Seeing giraffes doesn't even phase them at all! Isn't that funny? It was an incredible weekend adventure and I am so thankful for their hospitality. I will stay in touch with the family & I hope to visit there again sometime! THE GLASS IS HALF FULL- I’m making a conscious effort to make sure to send fun, light-hearted information about my experiences here in Botswana back home to my loved ones. 2/3 of the Peace Corps goals is to educate others about cultural experiences (I’ll write more about that later). I want to be able to share those cultural experiences with you as often as I can, but I realized today that I haven’t made a big enough deal about just how much I MISS EACH OF YOU. I’m looking at life with an optimistic viewpoint, but let me assure you, THIS IS VERY DIFFICULT. I hope that each of you know that I couldn’t do this without your love and support. Every day is a challenge and I am constantly reminded of each of you. I talk about my friends and family all of the time, I have truly been blessed. I am not miserable at all, but I do have my “downer days” as we like to call them here. I can’t believe I am a month into this new adventure! I will continue to hold my head up and love the life I am living here, but don’t forget just how loved each of you are! I am carrying you in my heart every moment of the day. PERSONAL GROWTH- Several of you asked in emails about how I am changing as a person. PHEW. That is hard to explain, but I will try my best. Moving to Botswana was hands down the most difficult thing I have ever had to do. I don’t recommend leaving behind your entire life as you know it, unless you know that your heart is 100% dedicated to what you have been called to do. Leaving everything familiar has put me in a state of extreme vulnerability, which is enough to leave anyone feeling uneasy. I wake up every morning in a country that is unfamiliar. Every day is a new adventure, and I never know what to expect. There is excitement in that, and also fear. I associate fear with the unknown – and a lot of what I’m doing here is still unknown. I am yet to discover exactly where I will live and work. I am yet to feel comfortable with my Setswana language skills. There’s a lot that I don’t feel stable about. I laugh when I talk with my friends here… I’ve described it to them in the following way: Imagine you’re standing on a rug and suddenly, someone pulls the rug out from under you and you fall down unexpectedly. Ok, well, we all know that no one likes to fall in public, so you gracefully try to pull yourself back up without people noticing that you feel like a complete idiot/you want to cry. There you have it folks- in a nutshell, that’s what my personal growth has been like. I’m learning to dust myself off and stand comfortably on my own in Botswana. The challenges keep on coming too… just as I start to become accustomed to life in Kanye, I will fall down again and surrender myself to another learning period, living entirely on my own in my new village. Life is a beautiful challenge I am ready to face! I promise to have more updates about my own growth here, but I often avoid blog posts that are too personal because it is difficult for me to put into words. SITE ASSIGNMENTS- As soon as I return from my travels in Shoshong, we will have another week of classes before we find out where I will be posted for two years. Do you remember how long I have been talking about the Peace Corps? Goodness gracious, it seems like forever. And now, on MAY 18, I will finally discover where I will be serving. It has been a long time coming!!! All of the trainees are becoming very anxious about our site assignments, it’s a very exciting/scary time. 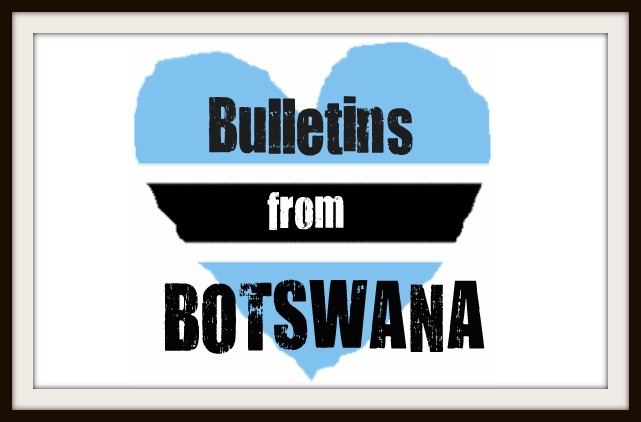 I am truly looking forward to learning more about why I have been called here to Botswana! Despite whatever happens, I go to sleep every night with a smile on my face. Even if I’ve spent the evening crying and feeling bad for myself for being so homesick, I remind myself that I am here living my dream. No one ever said it would be easy to follow your dreams, and I genuinely believe all the tears and hard days are more than worth it to be here. I was standing with some friends today in the streets of Kanye, and we all laughed. We’ve all imagined how our lives would be in the Peace Corps, and finally, here we are. Life here is not glamorous, time seems to move slowly, and people have much less than we have in America. Regardless, everyone is laughing, singing, dancing, and rejoicing in all the blessings they have in life. I’m learning to take certain things in life less seriously. Life is too short to ignore your heart and give up on your dreams. 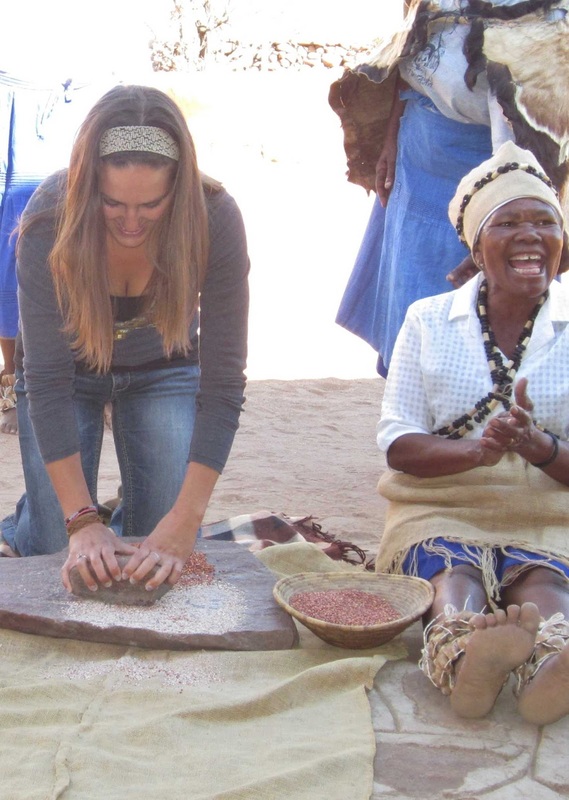 Trusting my heart & coming to Botswana has taught me that I am much stronger than I ever believed I could be. What is your heart telling you to do? I love each of you so much. I officially turned 23 in Botswana this week! One birthday down, two to go in Botswana! I was pleasantly surprised by how wonderful my birthday turned out to be. Before I explain birthday festivities, I wanted to update everyone on a few more things. I found out that I will be shadowing a volunteer named Amelia in Shoshong. 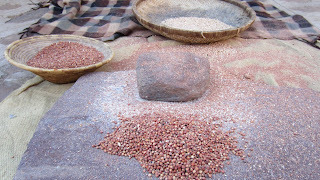 Shoshong is a small village outside of Mahalape (a little north of the capital, Gaborone). She is also a community capacity builder so I will have the chance to tag along with her in the clinics. 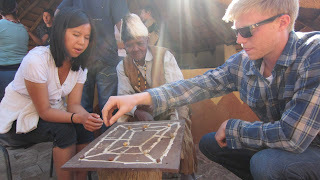 I am conducting a youth focus group while I am there to practice techniques to gather information about needs of the local community for when I go out to my own site. I met Amelia when I first arrived in Botswana (almost a month ago!) and she seems really great. She is fluent in setswana and I am hoping to learn a lot from her while I am there! My Birthday! It was really great having love and support from my new Peace Corps family. I received lots of chocolate, cake and cookies (yum!). I tried to explain this to my mom when she called, but a bar of chocolate is like receiving a new iPad. It's incredibly exciting. Everyone made me a big card and I can't even count how many times volunteers and staff sang me happy birthday. All of us were strangers five weeks ago, and somehow, I felt very loved and supported by my new support network here. Very comforting! School got out early on my birthday as well, so a big group of us went to a bar nearby to have a few drinks, play pool, and celebrate. I couldn't have been happier with how my birthday turned out! I miss everyone back home. Thanks for sending me all the birthday love from back home too!!! !Happy happy birthday to my grandpa (may 3), kate (may 4) and lizzy (may 11)!!! Tyler, yours is coming up too! look at the cute card dominque made! Jvani and the chocolate she supplied me with! Mary & the cookies she got me! I was lucky enough to attend a wedding last weekend with my host family and it was quite an ordeal! Weddings are not very common in Botswana due to the lebola, or bride price, a man has to pay before marriage (see my previous blog post for more information). When a wedding does occur, it last for four days. My understanding of it is that the first day (Thursday), it's like signing your papers at the court. 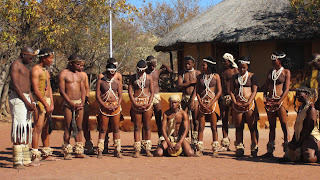 Here in Botswana, the bride and groom go to the kgotla to talk to the kgosi and they get all of that squared away. Other friends and family members can go to the kgotla, but only married people can go on this day. The men and the women separate and the bride and groom receive advice for their marriage as well. On the second day (Friday), there is a big combined celebration. Anyone is allowed to come, whether you are married or not. On the third day (Saturday), there is a wedding ceremony held at the bride's house. On the fourth day (Sunday), there is a wedding ceremony held at the groom's house. These are HUGE events. We're talking hundreds of people. And there is no such thing as invitations here, everyone just shows up. It's expected for the guests to bring other friends and family, so it was perfectly normal for me to show up there. The Batswana say that "party crashing" is just a way of life here. You can show up to just about anything unannounced and you will be welcomed and served food. Not a bad deal, right? At the beginning of day on Sunday, I went with my host sister and her cousins to help do the dishes and cook. It was neat to be helping the family and they enjoyed hearing the few phrases I can actually say in Setswana. The most exciting part of the day for everyone is in the morning... the groom walks with his side of the family/friends, etc and the bride walks with her side of the family/friends. They walk down a road toward each other, everyone is singing and dancing behind them, and when they finally meet, the couple kisses. It's a HUGE deal because it is not common to see any public displays of affection between Batswana. This was the only time I saw them kiss all day! After that, everyone heads to a big wedding tent where the actual ceremony is. I was surprised that the wedding party situation was very similar to the states. Bridesmaids are all wearing fancy dresses and the men are dressed in suits. The bride wore a white dress and the groom wore a suit too. It looked very western to me! There was a lot of praying, singing, and talking about how they met. They never actually exchanged "vows", but they do stand up and say how they met, how they knew they should be together, etc. Once the big ceremony was over, everyone separated into the bride and groom's family and ate lunch. I helped with the younger women to serve the dishes and give food to our elders. Everyone is very well fed, no matter how many people are there. Isn't that great? No need to RSVP to anything, there is always extra food for everyone. At this point, the bride and groom change their outfits three different times. Following every dress change, the wedding party choreographs a dance for entertainment. All of the outfit changes, dances, and talking took hours to complete! Weddings are very social events. It was wonderful to be a part of such a rich culture and people were very welcoming to me. 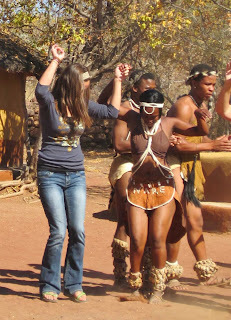 I was the only white woman there, so people were asking me about why I was in Botswana all day long :o) I got there at 8 to help set up, and I finally left around 5. I left early too. Can you imagine doing all of that for a wedding back home? We think one day of planning is a lot... try four!